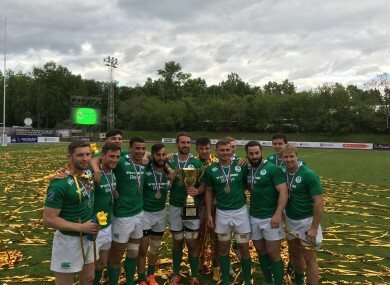 ON THEIR FIRST appearance on the Rugby Europe Sevens Grand Prix circuit, Ireland have won the first leg of the 2017 series in Moscow after defeating Spain in this afternoon’s final. After progressing through the group stages yesterday, Anthony Eddy’s side beat holders Russia in this morning’s semi-final before winning the competition’s decider 12-0 to kick-start their campaign in the best possible fashion. This weekend is the first time that Ireland have competed at this level with the tournament offering the chance to qualify for the Sevens Rugby World Cup. Ireland will head into next week’s second leg in Poland full of confidence after a dream debut performance. Email “From Russia with Love! Ireland win Moscow Grand Prix on debut appearance ”. Feedback on “From Russia with Love! Ireland win Moscow Grand Prix on debut appearance ”.